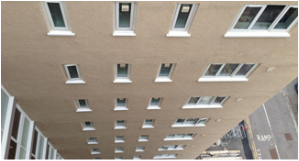 We undertook a survey to establish defective areas of render to all four elevations of a building block within the Q A Hospital complex. 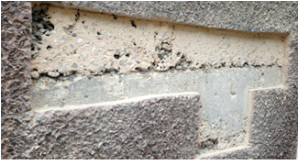 Once our initial investigations were completed it became evident that cracks to the render had appeared due to water ingress over a number of years. This was causing the gradual corrosion and expansion of the rebar, which in turn was causing cracking and debonding to the render. A completed survey was performed on all elevations, to establish the extent of repairs required. The method we used for the repair was to first clean all steels, prime them and then repair the concrete using a Ronacrete HB40 mortar. After these repairs were completed we then applied a Ronacrete waterproof render (two coats) which was then followed by applying a final texture coating. 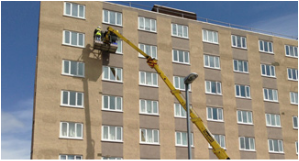 Once all repairs were completed, a full clean down was carried out followed by two layers of flexible anti-carbonation coating, applied to all elevations. We were initially asked to survey the concrete surrounds to internal columns around the edge of the pool area as there was evidence of external cracking.